Summary : Don't let the name fool you. This tea from Mighty Leaf is primarily a vanilla flavored black tea that is very rich, quite smooth and has no bitterness. If you like vanilla, this is a tea for you. Review : It's a long way, weather wise, before one can really realistically think of oranges. After all, a foot of snow is still on the ground. And besides, after the destruction of the California AND Florida citrus crop in 2007, I'm beginning to wonder if oranges will be a scarce commodity this year. And so, while thinking about oranges, I naturally became in the mood for one...but didn't have any at home. And so I dug through my teas and came up with a tea that had "orange" in the label...something guaranteed to get me to try it. The tea I dug up is from Mighty Leaf, and is a flavored black tea called Orange Dulce. Here is how Mighty Leaf describes this tea : "Orange Dulce is a luscious, rich brew teeming with notes of bergamot, orange, vanilla and jasmine blossoms. Made with Ceylon and China black teas, Orange Dulce brews up a fragrant and full bodied dark tea. Reminiscent of an aged Port, the flavor is sure to please." The Orange Dulce tea from Mighty Leaf contains the following ingredients : Black tea, green tea, natural citrus flavors, natural flavors, jasmine flowers. For a black tea, this tea has an absolutely wonderful aroma. The fragrance of the tea has both a strong vanilla and citrus aroma to it...something I took as a very good sign. Now, I'll admit...I'm always skeptical of orange and/or vanilla flavored black teas...for the simple reason that I've yet to find one that I really liked. And the ones I didn't like were REALLY bad...even from premium loose-leaf teas. The reason I never have found a good vanilla or orange flavored black tea is usually because the flavor of the black tea simply overwhelms everything else in the tea...making for kind of a bitter, nasty taste. Happily, that is not the case in the tea. 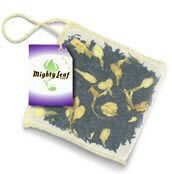 Mighty Leaf must scale back the amount of black tea in the tea, as the powerful flavor of black tea is happily absent. Instead, the flavor is more subdued...allowing the strong vanilla flavor of the tea to really come out. Yet, in another happy event, the vanilla flavor is really quite tasty and very smooth. Too many vanilla flavored teas I've tried taste like someone dumped raw vanilla extract into the tea and slapped the label "vanilla tea" on it. Now, one sad thing about this tea is that, despite it's aroma prior to brewing, the tea once brewed basically has no orange flavor at all. Similarily, while this tea does contain jasmine flowers, I tasted no jasmine in the tea at all...nor was I able to discern a hint of jasmine in the teas fragrance either. Still, for a vanilla flavored black tea, which is what this tea is at the end of the day, this creation from Mighty Leaf is excellent. Recommendation : Yes. This is mainly a vanilla flavored black tea...the name of the tea notwithstanding. If you like other vanilla flavored black teas, you'll absolutely love this one. And if you've never found a vanilla black tea you liked before...give this tea from Mighty Leaf a try, as it might surprise you. Brewing Instructions : Pour boiling water over tea bag. Let brew 4 minutes.